Creativity isn’t just a good idea but mandatory if you want to be a writer worth your gold (way more valuable than salt nowadays). The thing about creativity, though, is that you must be careful with the details. Why? Because there’s a fine line between creativity and believability. “I’m writing this with great grievance. I’m presently in Scotland, United Kingdom, with my family for a short vacation and we’re stuck. And really it was unannounced. We were attacked by four armed robbers on our way back to the hotel where we lodged. Not only were we robbed, but are completely embarrassed. All our cash, credit cards, and cellphones were stolen. We’ve reported the incident to the embassy and the police, but to my dismay, they seem not bothered…their response was just too casual. Our flight leaves in a few hours but we’ve got to settle our bills before we’re allowed to leave. Now I’m freaked out. Now then, as you’ve likely figured out, this is indeed a scam—but a scam that might’ve worked a whole lot better had they paid attention to minor details. Let’s pick it apart, shall we? From a creative standpoint, I’ll give this a 3 out of 5 stars, mostly because whoever wrote it upped the ante by adding in the ‘armed’ in front of robbers. Nice touch. I also like how the author included a ‘ticking time bomb.’ The plane leaves in a few hours and their bills must be paid or else. Will they make it out of the country? Cue dramatic background music. So those details totally work. What threw the story off was a single believability factor toward the beginning that instantly set off the needle on my are-you-kidding-me radar. She’s presently in Scotland? Sheesh! Scotland implies rolling hills and kilts, not roaming bands of AK47 toting thugs. Maybe if the author had said they’d been threatened with bagpipes I’d have bought it. Nah. Even that wouldn’t have worked. The creativity was there, but the details didn’t match. Why? Because Scotland doesn’t fit the connotation of a lawless land where desperadoes rob innocent tourists. Next time you’re in creative mode, crafting an intense scene, make sure your details enhance the story instead of pull your reader out of the action. Losing a wallet is one thing…you can always earn more money. 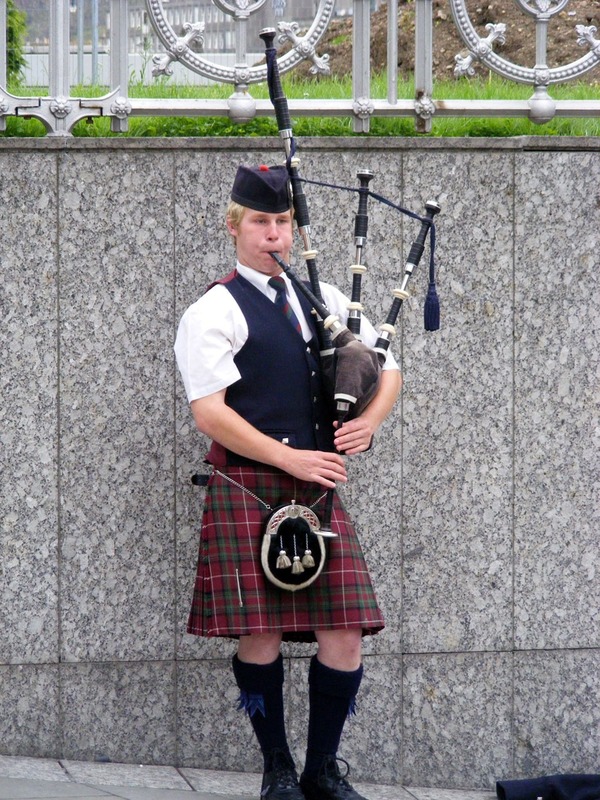 Regaining a disappointed reader is harder than learning the bagpipes. This entry was posted in Writing and tagged connotation, creativity, details, Michelle Griep by Michelle Griep. Bookmark the permalink. I’m sorry, I don’t like to be a nitpicker, and I agree totally with what you say in terms of our creative writing, but seriously, have you not seen Trainspotting? Scotland has big dirty cities with an underground drug culture, opportunistic criminals with knives and all the rest of it, just like everywhere. Just like the beautiful little island that I call home, Tasmania. I guess the moral of THAT story is don’t judge a book (or a place) by it’s cover. Nope, haven’t seen Trainspotting. Dare I admit I’ve never even heard of it? Google, here I come. Thanks for the heads up on that one, Megan! I do not think this rates a 3 out of 5 creativity ratio. I can’t believe you zeroed in on Scotland as the unbelievable point. Flights can be rescheduled, armed robbers would not leave witnesses, customs would not delay victims of crime because they couldn’t pay their bills. Even the $1650, why that specific amount? There are too many believability factors, I give this a 1 out of 5. You’re right…those other factors leave one wondering as well, but for me, it really was the Scotland thing. I had a great time when I visited there and didn’t see anything even remotely dangerous. That scam has been trolling the internet for years, love that you analyzed it! You’re quite right that there’s a credibility line somewhere in the mix. Readers are sticklers for believability and editors will zero in on things that don’t make sense. Good points. Bingo! That’s the post in one sentence. The funny thing about your scam example–I’ve received that same e-mail from THREE different “friends.” Talk about a lack of creativity! You’d think they would write a new scam letter or at least change a few of the details every now and then. Boring!!!! I think that’s a lesson for all of us, don’t you? Hmmm, what an interesting premise for a novel…what if writing creative scam letters was a hobby for the villain? Yep…ideas really are everywhere, eh? Love your real point here, Michelle. Truth is, we’ll never make ALL readers happy. However, what I think you’re saying is, anything that makes most readers stumble, stop to think, question validity, etc., will doom a creative story. In your example, odds are, the majority of people would at least stop to wonder about Scotland’s crime rate, and some, (GASP), even interrupt their story reading to Google it. Credibility is a fickle frienemy. Love this: CREDIBILITY IS A FICKLE FRIENEMY. You must be a writer! That’s a stunning line. Thanks for sharing.